Long before I became a gangly, daydreaming scientist in Winnipeg, I was a gangly, daydreaming boy in Fredericton, New Brunswick. On the hill where we lived, there was no shortage of sedimentary rock. Every year we helped to dig frost-heaved blocks of sandstone out of the vegetable garden. We would build sandstone walls, hauling the excess blocks to be added to our ever-growing rockpile. I would look for fossils in this stone, but I never found any, no matter how much I hoped. I would discover many years later that there are some wonderful fossils to be found in New Brunswick’s Pennsylvanian rocks, if you look in the right places. But we obviously didn’t live in the right place. Every school day we would walk down the hill to Connaught Street School. Sometimes during morning recess I would wander across the playground to the lower part of school hill. From there, you could see the low dark hills across the river, and in the clear autumn light I could watch the gulls and hawks circling over the river, flying away westward until they disappeared past Currie Mountain. Old forest cloaks the lower slopes of Currie Mountain. Now Currie Mountain was a completely different story, geologically, since we were always told that it was an “extinct volcano.” In comparison with the drab sandstones under our garden, this seemed exciting! Where was the cone? What if it erupted? 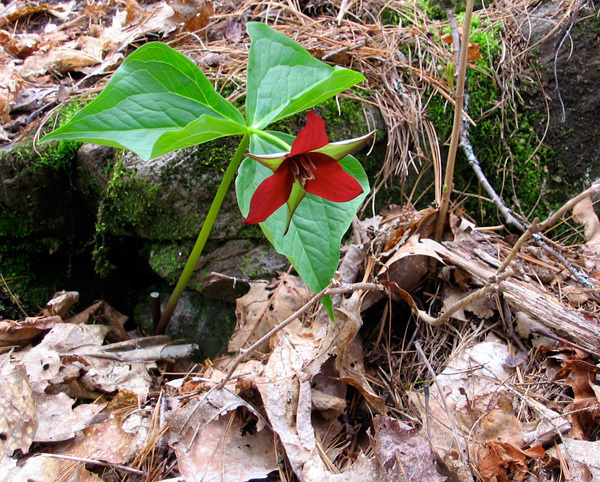 A solitary red trillium rises through the leaf litter. The real scientific story is perhaps a bit more dry, but nonetheless fascinating. 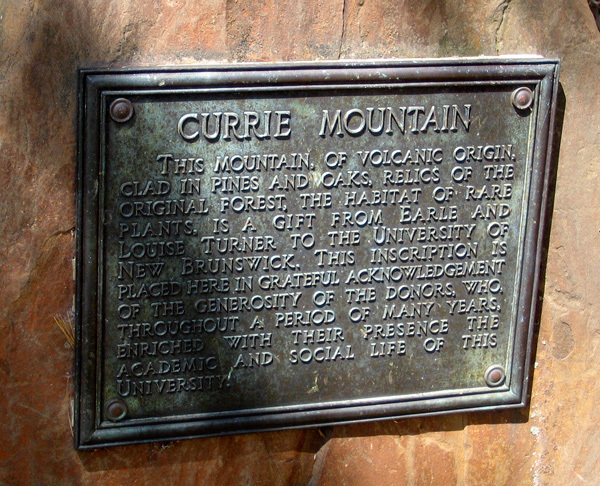 Currie Mountain is volcanic, and it is part of a very old volcanic system. It is a vertical dike or volcanic neck, a remnant of the system that fed a volcano. And it is ancient: it belongs to the Royal Road Basalt of the Mabou Group, which has been dated to the Early Carboniferous, somewhere in the range of 320-330 million years ago. Not only can this dike be seen, but there are lava flows just a little way away in quarries on the Carlisle Road and Royal Road. 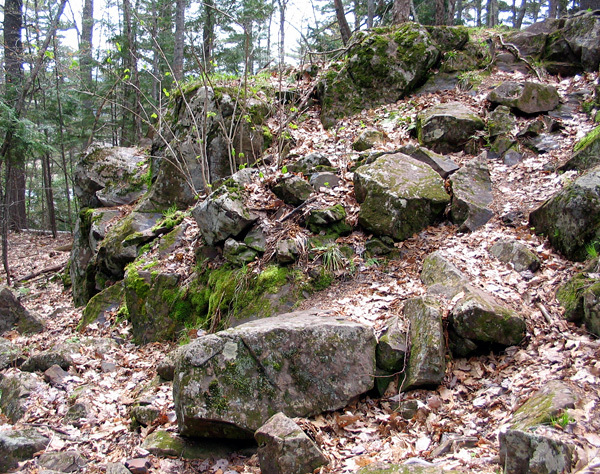 The Fredericton area may have been a bit short of fossils for the budding paleontologist, but it does have some wonderfully varied geology. 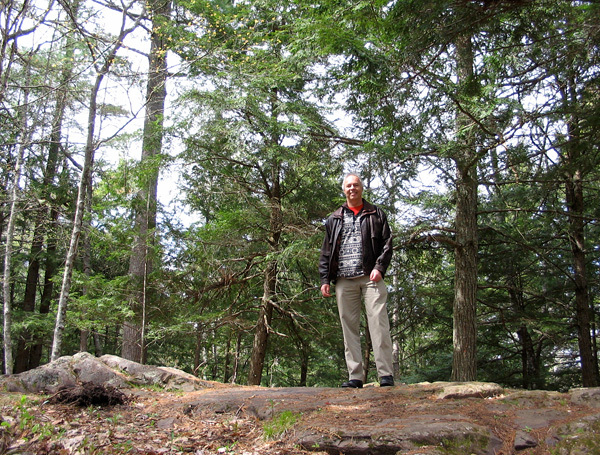 These white pines are old-timers. 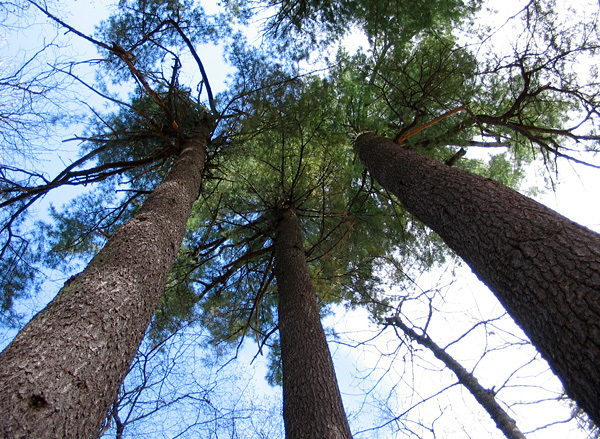 They may have lost their tops, but the branches don't even begin until fifty feet above the ground. This afternoon I walked up Currie Mountain with my brother, Chris. 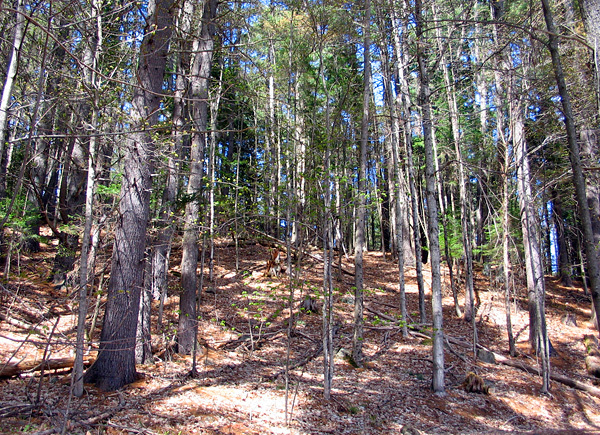 We started at roadside, strolling up through the old forest of hemlocks and white pines. At first, the slope is relatively gentle; we scuffed the pine needle-strewn path, enjoying the open view between the large trees. Half way up, a chimney at the edge of a flat area is all that remains of a house or camp. Chris stands on top of the "mountain." Above this, the path steepens as basalt begins to peek out between the trees and bushes. It is not a very long climb, since the flat top of the “mountain” at 260 feet above sea level is only about 180-190 feet (60 metres) above the road. But my legs have been adapted to the flat prairie for far too long, and I had to stop part way to let my thigh muscles recover. The view from the top more than compensated the pain: out past the giant white pines, old-growth hemlocks, and trilliums, we could see across the spring-brown flats and islands of the St. John River. 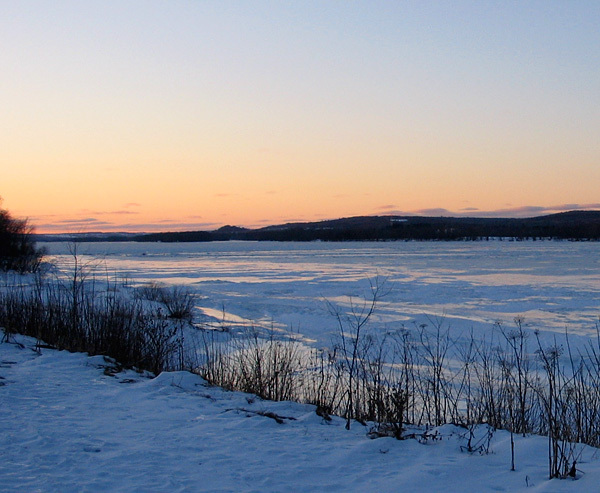 The St. John River at Fredericton in the February dusk. Currie Mountain is the dark mound on the horizon. That snow looks cold! Hell, it is even in the middle of river. Damn! While spending some time up north once, my guide commented that they could have 10m of the white stuff! Now, I like snow, but I like it to be gone in a couple of days. We have snow, here, bit it doesn’t last past tomorrow. Great little write up, with some nice background information. Much appreciated. Thanks, Steve. I know what you mean – I was out at Stonewall Quarry Park, near Winnipeg, last month, and it seems that someone has stolen every plaque around that place. I guess the metal value is too tempting; sad!